Miraval is a world class destination resort and spa in Tucson Arizona. Miraval sits at the base of the Santa Catalina Mountains. 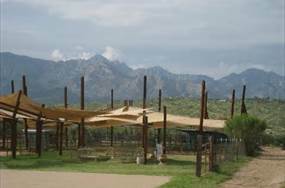 The luxury facility covers 400 acres of scenic Sonora Desert. It is about 40 minutes north of Tucson and 15 minutes north of Oro Valley, Arizona. Beautiful mountains provide a backdrop for the resort and spa. Miraval provides each guest a truly memorable experience. Posh lodging and stunning amenities create a very private retreat. Miraval offers a way to better health and well being. The spa facilities, activities and events are to be experienced and remembered. Miraval was stablished in 1996. The vision was simple but challenging. Provide guests a life changing experience. Demonstrate that every day life can be more meaningful and enjoyable. Create balance in the physical, psychological, social, spiritual and intellectual components of each person. Miraval guests come from around the globe. Their desire is to relax, recharge and discover how to live and feel better. There are no strict routines at Miraval. Guests select from by an array of programs designed to engage them. As they participate, they become more aware of themselves and their environment. The Miraval experience is a high-touch, individualized approach. An approach that has lead Miraval to become one of the most recognized luxury travel destinations. During 2004, Steve Case, co-founder of AOL, became the majority owner of Miraval. Based on his personal experience at the resort, he saw the opportunity to grow Miraval as a worldwide lifestyle brand name. Tucson has a number of other attractions to see and enjoy. Kitt Peak ia about 50 miles Southwest of Tucson. The Wild West still exists at the Old Tucson Studios West of Tucson. The Pima Air & Space Museum on the South Side of Tucson has on of the largest collections of aircraft any where in the world. Looking for a Home For Sale Tucson or having a winter retreat condo? We can help!